Who are the Shuar? Where are they from? And do they really shrink heads??? In this episode of Weekly Advice from Everyday Experts (The Shuar People – Do They Really Shrink Heads? ), Jason Menayan and Yours Truly discuss the Shuar people, as introduced in a very adventurous article on HubPages by Marie McKeown. Marie, as it happens, actually ventured to Ecuador with a friend to meet the Shuar people in person. She learned a great deal about their lives- both present and past. Listen in to learn more- and don’t forget to read the original Hub: Shuar: Meeting the Headshrinkers of the Amazon Basin. To ensure that HubPages continues to be the best place to write online, we have introduced new publishing standards over the past several weeks. These new policies are designed to ultimately provide benefits across our entire community of writers. While these changes in our publishing standards are designed to improve the overall quality of HubPages’ content and writing experience, we understand that it can be somewhat difficult to keep track of the new rules. You may notice that the policies regarding pixelated images, prohibited affiliates, overly saturated topics are new. If you have any Hubs that don’t currently adhere to these standards, don’t worry. We will send you an email letting you know which Hubs require revision, and you will have two weeks to amend those Hubs. If you do not have time to revise them in the first two weeks, they will be unpublished, but as soon as you revise them and resubmit them for publication, they can be reviewed and republished. We are also adding automatic alerts to the HubTool to let you know if you’re at risk of violating one of these site policies, so you don’t have to worry so much about whether a Hub will be moderated after its is published. If you see a warning message, read it carefully. It does not mean that your Hub will be moderated; it simply means that you may need to make some tweaks or be aware of heavy competition. As we pointed out last week, there is one final change that will be rolling out: we will be discontinuing the News Capsule. There are no changes that you will need to implement on that end; just keep in mind that if your Hubs contain News Capsules, they will disappear, but the rest of the Hub will remain unchanged. You might want to edit the formatting on these Hubs, but otherwise they should be fine. Thanks to those of you who have worked hard to update your Hubs- adjusting our writing to meet new site standards is something that we’re all working on- even Paul Edmondson has had to revise some of his Hubs in the past couple of weeks. The great thing about this spring cleaning is that in the end, HubPages will be a better place to write and read awesome online articles than it ever has before! 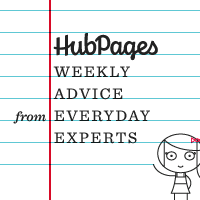 We’re launching a new podcast (in addition to Weekly Advice from Everyday Experts) called the Online Writing Insider in which experts from the HubPages staff share some tips on writing online. Since this is our very first podcast in the series, we’re starting with the basics: Creating the Best Online Title. What are the elements of a good online title? How do they differ form common titles used in the offline world? Robin and I discuss these points in the podcast. Is there something you would like us to cover in future podcasts? Let us know in the comments! I’m not sure if you’ve taken a look at our Success Stories, but if you have a look, you’ll see a pattern in each successful Hubbers’ traffic graphs, the Panda update notwithstanding: their traffic tends to grow over time out of proportion with their Hub publishing activity. Not only does each additional Hub give you more overall traffic (that part’s a no-brainer), but each additional Hub raises the average traffic per Hub. Yes, you’re reading that correctly: our most prolific Hubbers are getting almost five times the traffic per Hub as the one-timers. Why is that the case? There are several theories that make sense to us. First, the more you publish on HubPages, the more you generally understand what types of Hubs get traffic. You might learn more from Learning Center entries, tips in the Newsletter, suggestions from fellow Hubbers in the Forums, and you might also see patterns among the Hubs that have gotten traction from the search engines. In short, you become a more savvy online writer. Second, each additional Hub might be enjoying the benefit of your growing readership. The more you publish, the more followers you generally have, so the more people you have reading your Hubs and sharing them (like through social media) with people they know. Third, the more you publish, the more your profile page accrues Page Rank so that your Hubs might enjoy better provisional ranking based on the trust Google has for your type of writing. Many of our well-published Hubbers have profile pages with Page Ranks of 4, while those who only bothered to publish 1 or 2 Hubs have Page Ranks of 0 or 1. These theories are just educated guesses; there might be other factors at work, as well. But, nevertheless, the data supports continuing to publish Hubs if it’s readers, traffic, or earnings that you’re after. Far from being a matter of diminishing returns, publishing high-quality Hubs is a craft that pays ever-increasing dividends. After analyzing the data I realized something surprising: the results mirrored by own experience as an author on HubPages. Most of my 29 Hubs are about classical guitar music. My first Hub, which received 9 visits last month, was about a classical guitar textbook that I use with my teacher. I like this textbook, and was happy to share my experience using it. A few friends suggested that I write my next Hub about a piece of music that I like. I realized that Hubs are great for writing about music. I included a biography of the composer, a video capsule of someone performing the piece, an Amazon capsule containing a professional recording of the piece, and a link capsule of sheet music. My first few music Hubs were about pieces that I was just learning about from my teacher. My Hub on Legnani’s Caprices, which received 26 visits per month, is an example of a Hub that I wrote around this time. My friends then suggested that I start using Google’s traffic estimator to see which guitar pieces get more searches. I learned that while “legnani caprices” only gets 210 global monthly searches, “villa lobos etudes” gets 1,900 global monthly searches. I started writing Hubs about pieces that get higher search traffic. My Hub on Villa-Lobos’ Etudes received 191 views in the last month. Late last week, Paul Deeds pointed out in the forums that we’re introducing and testing some updates to the HubTool’s text capsule- and if you would like to have a look at it, you’re free to try it out! Resizable edit area – After clicking “edit” on a text capsule, you can hold your mouse down when it is over the lower right corner of the edit box and drag the corner in order to size the edit window comfortably for your screen. Word count – the number of words in your text will appear at the top of the edit dialog, while you are editing a text capsule. Hub search – search for Hubs that are relevant to your selected word, or phrase. This search takes into account the category of your Hub. So, the results should be both more convenient and more relevant while you edit your capsule, than opening another browser window to search for Hubs to link to. Search your own Hubs – the link tool allows you to search your own Hubs. This should be more convenient for creating links to your own Hubs, especially if you have a lot of them. Amazon links – the link tool will now allow you to search for Amazon products appropriate to your Hub and create links to them. Links entered in this way are subject to revenue sharing splits, and you are still bound by our rules on affiliate linking (no more than 2 per Hub). Keyboard short-cut – While typing text into a text capsule, you can strike ctrl-e. This will automatically select the nearest word an launch the link dialog. From there you can hit enter to search for relevant Hubs and use keyboard navigation to select the Hub you want to link to. 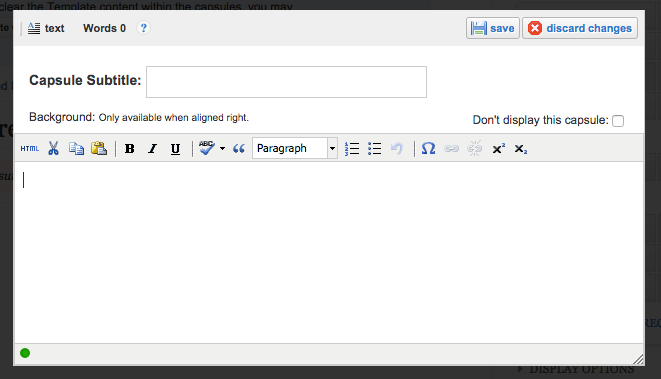 This allows you to add links to your text without taking your hands away from the keyboard. What inspired these cool updates? Well, we wanted to upgrade tinyMCE, the open source software package we use for our text editor. It is an important piece of HubPages. So, it is a little risky. For that reason, we wanted a phased roll out where Hubbers could try it if they wanted and back off, it there were problems. It seemed kind of lame to ask people to test the same old features. So, I asked for feedback among HubPages staff, about what they wanted, or had heard of Hubbers wanting in the way of changes to the text capsule. The features I ended up implementing are mixture of various people’s suggestions. When did you get started with making these changes to the text capsule? That would have been three or four weeks ago, right after I hacked the old version of tinyMCE to work with IE9; the chore that inspired wanting to upgrade. Which is your favorite new feature? Where should people report any bugs they encounter? I’ll be checking the forums for bug reports. Just in time for spring, Robin and I bring you a new Weekly Advice from Everyday Experts episode on Five Awesome Tomato Plants to Grow in Your Garden. This episode offers a look at 5 Unique Tomato Plants to Grow In Your Garden by Barkley Rosehill – an excellent food Hubber from Philadelphia. The varieties he recommends are both beautiful and absolutely delicious-sounding! After recording the podcast, Robin and I were absolutely dying to start growing these ourselves. We hope you find this podcast, and Barkley Rosehill’s Hub, to be inspiring too! As we’ve mentioned in earlier blog posts, we are continuing to identify ways to improve overall Hub quality and present the most useful, interesting and informative content to readers on the Web. Enhancing readers’ experience on the site will improve our visibility with searchers, and reward those Hubbers who spend the time and energy to publish truly remarkable Hubs. We are about to implement a few more changes to improve the overall experience of our site, aimed at removing content that offers dubious value to the HubPages community of writers and readers. In a few weeks we will be ending support for the News Capsule. We’ve found that in most cases, the News Capsule didn’t add much relevant information to a Hub’s topic, and often included links that were only distantly related to the topic. If you have News Capsules in your Hubs, you don’t have to do anything – they will disappear on their own. However, if the News Capsule was somehow important to the layout of your Hub, you might want to take the opportunity to refresh your Hub a bit so it doesn’t feel as if something is missing. Next week, we will be introducing two changes as they relate to affiliate links. Affiliate links are promotional links that financially reward marketers for sending visitors to another site. If you have used affiliate links in your Hubs (except for Amazon or eBay Capsules), please read this carefully. Second, in certain topic areas that have become saturated with low-quality Hubs published by affiliate marketers, we are disallowing any affiliate links and holding Hubs to a higher editorial standard. Links to trustworthy sites (like prominent news sites, Wikipedia, and the like) will still be allowed, but affiliate links of any sort will not be permitted. We’re including topics like acai berries, forex, and six-pack abs among those in this new classification. Note: you can still publish Hubs on these topics; you are just now not allowed to embed any affiliate links into them. This change will only affect about 1% of all published Hubs, so not many of you will impacted. Next week, we will put in automatic alerts that will let you know as you’re authoring a Hub or when you go to publish it, if your Hub will not comply with these rules. We will also email Hubbers with affected Hubs that need to be fixed, with at least 2 weeks to bring those Hubs into compliance before we unpublish them. We hope this all makes sense, and look forward to the quality bar being raised once again! UPDATE: Regarding redirects (sites like tinyurl, bit.ly and others that redirect to other sites). Redirects themselves are innocuous, but we will be able to track the full path of redirected links, and if any of the redirects pass through or to a prohibited link, then that redirected link will also be prohibited. So, if a bit.ly link passes through a clickbank link (a prohibited affiliate link), for example, then that specific bit.ly link on that Hub will be not allowed. HubPages Ad Program: now open to everyone! We are pleased to announce that the HubPages Ad Program, first announced in late February, is now available to all Hubbers, ahead of schedule. Now all Hubbers with active Google AdSense accounts can participate in the HubPages Ad Program and tap into an additional income stream from their Hub traffic. What is the HubPages Ad Program? The HubPages Ad Program incorporates an optimized mix of premium ads from multiple ad partners that will run alongside the Google AdSense ads on your Hubs, as well as any Amazon or eBay capsules you use. Most of these ad partners are premium ad networks and agency networks that work only with the largest online publishers, so the HubPages Ad Program gives Hubbers access to the types of high-quality online ads that are usually out of reach for small publishers. Additionally, you will be able to share earnings from directly-sold advertising, which HubPages is presently working to secure. Your earnings are ultimately dependent on the amount and quality of the traffic to your Hubs, much like your AdSense and Amazon earnings are. Our first group of beta users saw an average increase in earnings of over 50%, but each Hubber is different. The HubPages Ad Program will typically depress your AdSense earnings, but that loss is more than made up for in HubPages Ad Program earnings. You must have an active Google AdSense account associated with your HubPages account, you must have an active PayPal account (PayPal is the only disbursement method we use for payment), and you must fill out the necessary tax declarations, regardless of your country of citizenship or residency. We pay out monthly when you reach a $50 threshold via PayPal. You can find answers to other frequently-asked questions about the Program on this page. We hope you find the HubPages Ad Program a beneficial one for your earnings! To sign up, please click the configure button for the HubPages Ad Program under your Affiliate Settings (under Earnings): click here. HubPages has always believed in open publishing platforms and giving Hubbers as much freedom as possible to share their knowledge with the world. At the same time we have always taken content moderation seriously and work hard to be great Net citizens. Today, I posted a few questions regarding best practices to the Google Webmaster Forum. For the community of great writers here at HubPages, we will keep you informed as we work to understand the recent Google changes and how to best maintain the platform for all of the writers here at HubPages. What are the best practices for open publishing platforms due to the recent Panda update? In particular, where high quality content on a domain has been negatively impacted on average as much as any other content? Is it a question of content moderation, site architecture, both or something else? While we believe the democratization of publishing and earning potential is an important part of the progress of the Web, we want to avoid a situation where a portion of content negatively impacts the rankings of high quality content. It appears HubPages has been impacted by this while YouTube has not, despite HubPages having a more strict content policy. In Google’s view, what is the recommended moderation standard that open publishing platforms should enforce? Open publishing platforms tend to use one of two domain models. WordPress, Tumblr, Blogger organize mainly by subdomain, while HubPages and YouTube organize all the content under a single domain. Is there a recommendation on the best practice for open platforms regarding architecture? In an effort to give Google clues, HubPages’ internal linking structure promotes the best content. For example, we program the “related articles” suggestions with content that we think users will find useful, and we submit sitemaps with a set priority so Google knows the most important content. We also understand the challenges of fighting off spam, spun articles and various forms of attacks; we believe we do the industry’s best job of fighting spam in an open publishing environment where every individual can have a voice. Feedback from Google on open publishing platforms best practices is greatly appreciated. Absinthe- the once-forbidden drink. What is it? Where did it come from? And how does it affect us? In Weekly Advice from Everyday Experts Episode 2: An Exploration of Absinthe, Pia Chatterjee and I explore the allure of absinthe as guided by the fantastic Hub “Absinthe Makes the Heart Grow Fonder: How Does Absinthe Really Affects Us” by restaurant proprietor and Hubber extraordinaire Mrs. Menagerie. As it happens, absinthe is positively steeped with interesting history, cultural references, artistic flourishes, and interesting practices. You don’t want to miss this podcast! Hat tip to Mrs. Menagerie for the brilliant Hub. Check it out for yourself to read more fascinating details and to have a look at the beautiful photos.